And so ends the transformation of these miraculous weapons from a solid, to a liquid, and, finally, superheated gas. What comes next? No one knows. 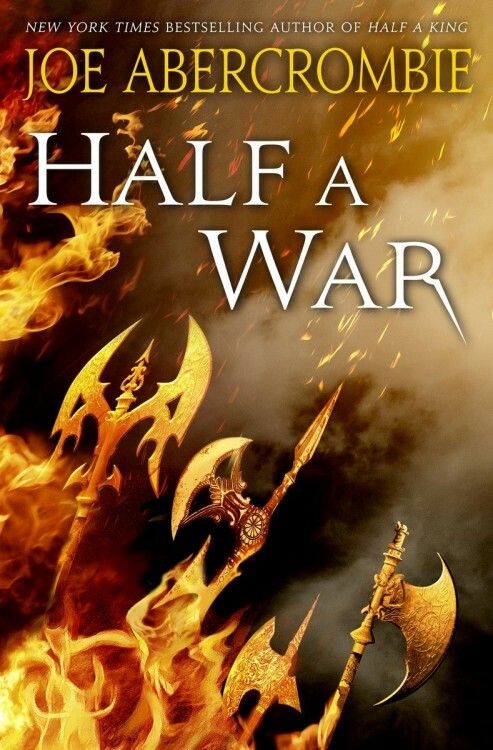 Half a War is the concluding volume in Joe Abercrombie’s YA/sorta-YA fantasy the Shattered Sea trilogy, which began with 2014’s Half a King. The second volume in the trilogy, Half the World, will be published in February 2015, and Half a War is expected to be published in July 2015. EDIT (Dec. 4th, 2014): I’ve been informed by Random House that this cover is not final. I’ll be sure to post the final cover art when it’s officially revealed. Surf’s up, boys and girls! 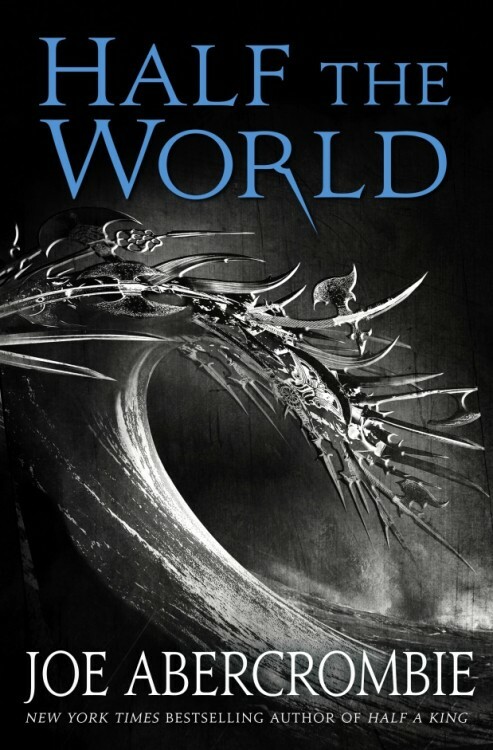 Here’s the US cover art for Half the World by Joe Abercrombie, sequel to his soon-to-be-released YA(ish?) novel, Half a King. Just remember to apply a healthy layer of sunscreen chain mail before hitting the waves. There was a harsh gale blowing on the night Yarvi learned he was a king. Or half a king, at least. A seeking wind, the Gettlanders called it, for it found out every chink and keyhole, moaning Mother Sea’s dead chill into every dwelling, no matter how high the fires were banked or how close the folk were huddled. It tore at the shutters in the narrow windows of Mother Gundring’s chambers and rattled even the iron-bound door in its frame. It taunted the flames in the firepit and they spat and crackled in their anger, casting clawing shadows from the dried herbs hanging, throwing flickering light upon the root that Mother Gundring held up in her knobbled fingers. I can just picture mothers and fathers reading this to their children as they lay curled within the warm cocoon of their blankets and jammies, Abercrombian nightmares biding their time until the light is flicked off. Joe Abercrombie confirmed Monday that the first draft of his next novel, Half a King is, for all intents and purposes, done. The “kind of YA kind of crossover whatever the hell it is” has completed its copyedits and is ready for its publication on “July 8th 2014 from Del Rey in the US, and a not totally specific though probably very similar July date from Harper Collins in the UK,” says Abercrombie. He also indicates that ARCs (and thus the first reviews) should start appearing over the next handful of months. [Half a King is] much shorter – 80,000 words compared to 175,000 for my shortest, Red Country, and 230,000 for my longest, Last Argument of Kings (though still over twice the length of The Lion, the Witch and the Wardrobe, believe it or not). It’s set in a very different world with what you might call a viking or anglo-saxon feel. It’s much more focused, with a single point of view. It’s not so overtly ‘gritty’ although it’s a long way from smooth. I’ve published six hefty adult fantasy books in seven years. Although I’ve tried to make them all different in some ways – different structures, different settings, different points of view – they’re all pretty beefy, they’re all set in the same world, they have a similar tone, they cover some of the same ground. Though I’m very happy with and proud of the result, Red Country was a difficult book to write. I felt at times somewhat uninspired. Somewhat burned out. I really didn’t want, as I had every time in the past, to go straight on to working on the next book in the First Law world right after finishing one. I felt the need to step back, recharge the batteries, try something at least a little bit different. But at the same time I didn’t want the acorn to fall too far from the tree – I wanted it to be something that my established readers would enjoy, or perhaps even love with a flaming passion. I wanted to set up two separate lines of work that would complement each other creatively and commercially. More than any other contemporary author, Abercrombie is known for injecting life (and, perhaps it could be argued, popularizing entirely) the fantasy’s popular movement towards ‘grimdark’ storytelling (don’t know what that it? Let Elizabeth Bear tell you), so it’s unusual (but, if you ask this guy, refreshing) to see him step away from that completely for his next series. As much as I enjoy Abercrombie, I can only take so much of his trademark droll dialogue, self-destructive characters (despite my love for them!) and frenetic violence before I feel like the world’s about to fall out from under my feet. 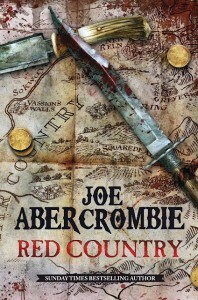 Abercrombie describes Half a King as ‘punchy’ rather than ‘gritty,’ and he hopes ‘to deliver a slap in the face with every page.’ The biggest issue with some of his recent books is their tendency to feel like the author was trying to ‘out-Abercrombie’ himself, to up the ante beyond what he’d done previously. So, I’m looking forward to this change of pace. It sounds like just the thing to re-energize the (self-described) burned out author. My plan now is that the two sequels, cautiously titled Half the World and Half a War, will be my main focus for the next year or so. I’m already a few chapters into the first draft of the second book. I hope to have those two books finished not long after the publication of Half a King in July 2014. Then I’ll start work on the adult trilogy in the First Law world. So that’s me kept pretty busy ’til … at least winter 2017, I’d say. Which is both rather nice and rather horrifying. 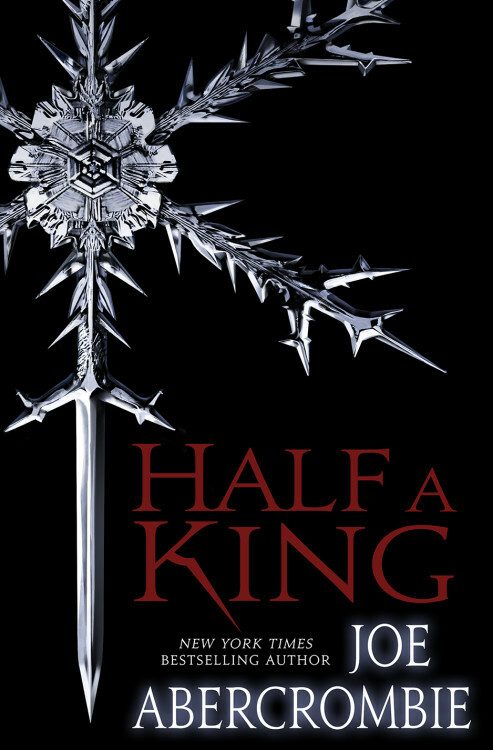 Half a King will be published by HarperCollins in July, 2014. The sequels, Half the World and Half a War, will follow at six-month intervals. It’s interesting to note that Abercrombie has sold more than three million books to date. That’s a hell of a lot.